The cup-tie was originally scheduled for Saturday 14th December 2011 but was postponed due to the unseasonally cold weather in New Cumnock at that time. The SJFA convened a panel of their finest planning consultants to set a new date for the tie. Great to see the Lok back at Lok Park! Weather permitting Glenafton will play their first competitive game in three weeks since the victory over Hermes in the Scottish Junior Cup. A couple of worthwhile friendlies, 2-0 win over Stranraer and 2-2 draw with Irvine Meadow, may have helped maintain the match fitness of the players but only enhanced the supporters appetite for a game before the New Year. Few would argue that a home game against Pollok is the perfect pick me up for football hungry fans, who have sorely missed league games against the Glasgow giants in recent seasons, having previously enjoyed sharing seven seasons in the top flight together. Few would also argue, that by their own high standards (including no fewer than 4 West Region Premier titles) the current league campaign is disappointing and unlikely to end with a fifth flag flying over Newlandsfield. Similarly, the Glens’ recent run of league games has not yielded the same return in points as those garnered earlier in the season and the escapism of cup football may be just the tonic for both clubs. Both clubs have played one competitive match since the postponement of the tie in December. Pollok travelled to Clydebank last Saturday where the Bankies completed the ‘league double’ over the ‘Lok with ex-Glenafton defender opening the scoring in the 3-1 win, while the Glens recorded a 1-0 home win over Rutherglen in the league. Pollok last won the West of Scotland Cup in season 1999/00 when they defeated ……. Glenafton Athletic. The two sides met on midsummer’s day of the new millennium at Cambuslang Rangers’ Somervell Park. The Glens opened the scoring in the first half when former ‘Lok player Boris McLaughlin picked out Scott Archer in the box and although his effort crashed off the underside of the bar Robbie Newall rushed in to thump the rebound home. Early in the second half a ball across the face of goal by Pollok skipper Ian Morrison set up former Kilbirnie Ladeside striker Alex Eadie to tap in the equaliser. In the last-minute Eadie headed home a corner kick to win the West. 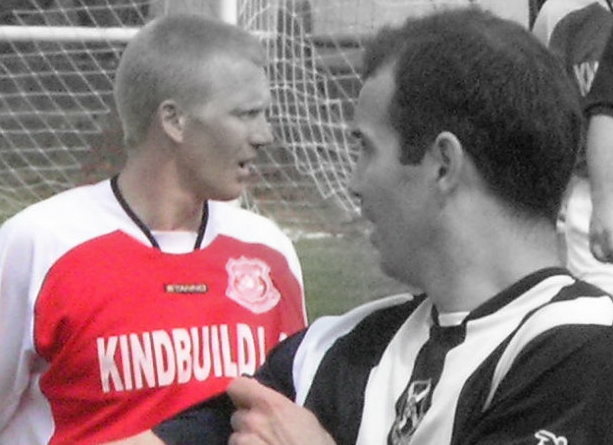 In later years two players in the Glens’ team that day, captain Joe Carruth and midfielder Richie Newall, joined Pollok, However, today following the departure of Jamie Doyle last week there are no former Glenafton players in the current Pollok squad, although Stephen Docherty is on the coaching staff. In Season 2001/02 the two sides met in the second round of the competition at Loch Park and a Stuart Boyd strike from the edge of the box settled the tie in favour of Glenafton. Glenafton last won the West of Scotland Cup in season 2005/06 ….. at Newlandsfield. Kevin Murray gave Maryhill the lead at the interval but man-of-the-match Steven McGregor rose head and shoulders above the ‘Hill defence to head home the equaliser. Robbie Mitchell put the Glens one up in the penalty shoot-out and then keeper Gary Matthews blocked Bryan Dingwall’s spot kick to make it advantage Glens, an advantage they didn’t surrender on their way to winning the West for the second time. Legendary Glens’ goalie Gary was forced to change his top at the beginning of the game and played throughout the final in a Pollok shirt loaned by the hosts, while of course in later seasons Bryan Dingwall would go on to attain legendary status with Pollok as a prolific goalscorer. This entry was posted in GAFC Fixture and tagged Glenafton Athletic, New Cumnock, Pollok, Scottish Junior Football, West of Scotland Cup. Bookmark the permalink.